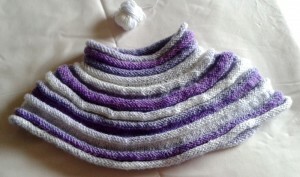 Cathy left a comment on my post on Wednesday about the knitted cowl I featured. I decided to answer her questions here in a separate post. Now that looked like an awful lot of stitches to have on the needles at one time. How long did it take to do one round? For years I just used a piece of contrasting wool for a marker, then some swish plastic things, then discovered something similar to Elly’s creations that are so much nicer (and for some reason easier) to use. Will you be using them again soon? An old knitter here – my fingers never got the hang of that crochet lark. Or maybe it was my mind that couldn’t cope with the different method and process. First off. I will certainly reuse the stitch/row markers that Elly made when knitting in the round. The more traditional stitch markers will be used for marking increase(s)/decrease(s) in forward and backward knitting. I was never a fan of the traditional long straight needles. I always manage to bump them against my upper arms leading to a multitude of bruises. Not a pretty sight! One year Elly gifted me with a set of interchangeable circular needles from KnitPro™, for Christmas, and I never looked back. The detachable cables range from about 30cm to 120cm and with a set of cable connectors, they can be joined to suit any number of stitches and make for very smooth knitting. The actual ‘needles’ fit neatly into my hands and are warm to the touch and very comfortable for anyone with arthritic hands. Cathy, I regularly get an idea and see it in my head, in 3D. Most of my best efforts are worked that way. It may float around in there (plenty of empty space to do so! 😆 ) before I begin to play about with it, making the pattern up as I go along. A year or so ago, I saw a lady across a crowed café with a softly draped silk scarf, and it gave me the idea for the cowl. I was working without a pattern and wanted to knit the cowl in the round, using a random rainbow yarn. As you can see from the photo below, I had a selection to choose from, most were single skeins that I had inherited. I chose the middle one, They are all the same brand and suitable for needle sizes 4mm/3.25mm. A skein is – 100g/300m. I had to think about the number of stitches I used…… One hundred and ninety, I think. #190. I become so engrossed when I begin a project, that I forget to write down the details. The stitch I chose was stocking stitch throughout – changing from plain to purl stitch after about five rows – on occasion I worked ten rows before changing. The plain rows of stitches allow the fabric to curl. The purl stitches curl in the opposite direction. After about four groups of pattern, I reduced the number of stitches evenly around the circle of stitches. I think it was one stitch in every ten at the end of a plain pattern group. Does that make sense? The tiny scrap of yarn above the cowl is all that I had left over from the skein. Cathy, you talk about having difficulty with crochet. I too, had trouble in the beginning. Holding the yarn in my left hand while working the needle in my right proved to be a total disaster. Eventually I mastered the craft by holding the yarn as I would for knitting! This entry was posted in Crafts and tagged Crafts, Crochet, KnitPro™. 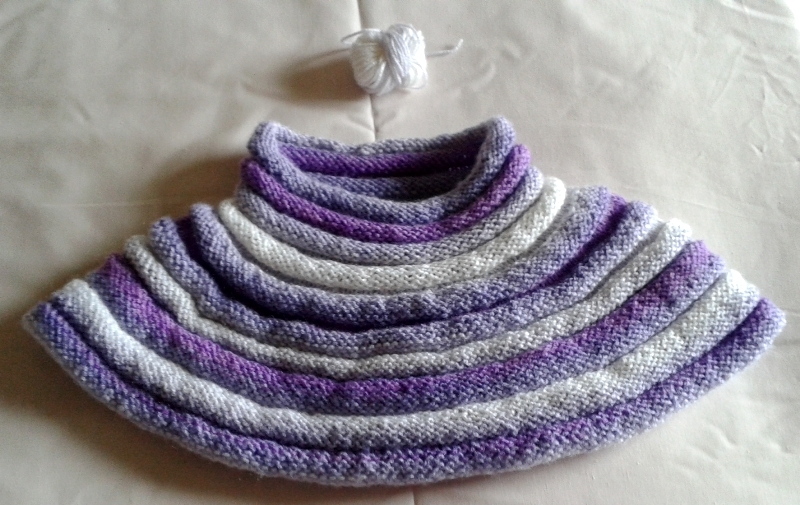 Interchangable cable needles, Knitted cowl, Knitting on September 19, 2014 by Grannymar. WWW, I am keeping all my yarn left overs and will join them in the ‘knotty’ way, before using them in a project – what it will be, I as yet have no idea! Dianne, I am right handed, but often use both hands for to do things. Not quite, but I manage to do things like painting (decorating) with both hands and when I broke my wrist some years ago, my left handed mouse skills improved 100%! This is great. I hope Cathy reads this post. I think she is traveling right now? Yes, I realise she is on the move but the link above should go to her inbox or blog. Just popped in to sat Thank You – will look at this properly in a few weeks time Gm. Cathy, I knew you were going away, but didn’t want to forget to write the post. Enjoy your travels.